If you have any doubts please contact us so we are sure you order the right ring size. The most precise way to measure you finger is to go to a professional jeweler and have it measured with a ring sizer. Send us an email on info@hanieljewelry.com if you are in central Copenhagen and we can schedule for you to come to our Atelier and we can measure it. If you want to measure it yourself then take a ring, you already have and measure it with a rule. 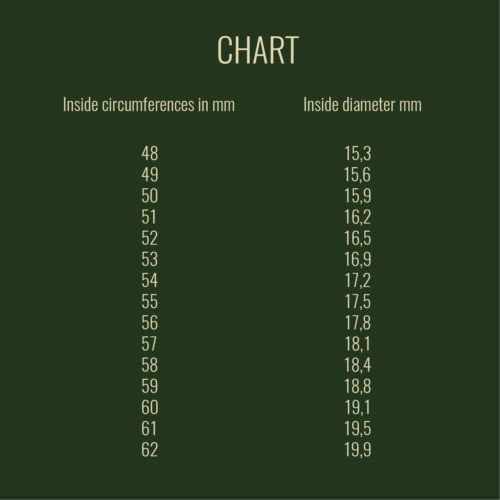 Measure the inner diameter of one of your rings with a ruler, note the size and look at the chart and you will know your size in millimeter. Tip: Measure your fingers when they are warm/ swollen so you prevent from choosing a too small size. If you are in between sizes, choose the one size bigger.